How much better is faster? Following the release of their successful Propel back in 2014, it didn’t take long for Giant to begin working on the next generation of their aero road bike. In fact, the turnaround time was almost immediate when they began to tackle new aero design themes, which could make the new version a much more successful bike with improved aerodynamics being their top priority. Besides coming up with a completely new frame geometry, which involves an all-new structure, Giant also wanted to discover if they could make a disc road bike more aerodynamic than their previous Propel, which came with standard rim brakes. Compared to the previous version, Giant’s all-new. Propel has a much sleeker and aerodynamic profile. To find out, Giant went to the drawing board in the ACE wind tunnel in France to see just how much of an aero hit a bike with disc brakes would take. Once proven possible in the tunnel, Giant built a completely new Propel, which is an aerodynamically superior bike to the previous version. The bike now has a greater stiffness-to-weight ratio as well as better braking. In addition to the frame, Giant also looked to improve their wheel spec, as well as a new bar/stem combination, to maximize the bike’s aero efficiency. Impressively, a Shimano Dura-Ace power meter comes equipped on the SL Advanced 0, which makes this bike virtually race-ready out of the box. When designing a wind-cheating aero road bike, disc brakes certainly aren’t the first idea that jump to one’s mind. From the previous, hidden rim brake setup, one could see that it would be a great aero advantage rather than having a rotor and caliber in the middle of the front wheel. However, Giant firmly believes in disc brake application on all road bikes. Giant did the end user a big favor by making access to the internally routed cables as easy as removing the stem’s top cap. In actuality, it is more important to keep the fork crown area clean other than the caliper, as the caliper already has dirty air passing over it from the wheels, tires and spokes. Giant first started in the lab running through hundreds of Computational Fluid Dynamics (CFD) programs to first prove that they could build an aerodynamic bike around the front disc brake system. The ACE facility wind tunnel in Magny-Cours, France, is where this new Propel was truly born. More than 300 iterations of tubing for this frame were made through their CFD process to come up with their new truncated ellipse shape. This new shape is a complete 180 degrees opposite of the traditional teardrop tube shape, which is seen on many aero road bikes. The new tube shape is utilized almost everywhere on the new Propel, excluding the cockpit area. This new design lowers drag at a wider range of wind angles. The new frame is substantially stiffer than the previous Propel, and the way Giant did this was by adding stiffness from inside the frame with their carbon lay-up. From looking at the Propel, you will not see any cables as they are all integrated throughout the frame. Shimano’s Dura-Ace Di2 was on our Propel at the launch, and the only cable that was showing was the rear derailleur. Giant did extensive wind tunnel testing to ensure the Propel’s aero qualities are maintained with the disc brakes. The front fork is where 75 percent of the development time was spent. To take on the force of adding disc brakes, the fork had to be stiffened and bulked up. The front fork legs are different, as they have an asymmetrical shape to them. The front wheel is spec’d with a 12x100mm thru-axle and the rear has a 12x142mm thru-axle that both require a hex wrench for removal. Giant claims the new frame only weighs an additional 45 grams more than the previous Propel. Once in the wind tunnel, Giant used their mannequin (with moving legs) versus the bike by itself or with a stationary mannequin to simulate a more real-life testing scenario. For the testing procedure, they used 24-mph wind speed with a temperature- and humidity-controlled environment. The yaw angles ranged from 0 to 30 degrees during testing. The bar and stem are completely new on the Propel. Gone is their previous one-piece bar and stem combo, and now it’s a two-piece but still an aero system. The idea with the new two-piece bar/stem system was to achieve an easier user experience. Giant has worked closely with the Sunweb WorldTour team mechanics on how to make this a simpler process. The steps that are involved in producing a new frame are far more complicated than most would think. The new integrated Contact SLR/SL Aero handlebar/stem unit offers full internal cable routing. There is a cap that comes off the top of the stem where the cables sit nicely and easy to get to. With their new bar/stem, you can put on different-size stems and bars, which may not have been available in the past with their former Propel one-bar system. You do have to use their bar and stem, though, for it to work together. One distinct feature on the new Propel is the house-brand carbon wheels that mix a 65mm rear wheel with a 42mm-deep front wheel. These two wheels were developed specifically for the Propel, and Giant says they would have gotten even better numbers in the wind tunnel by putting a larger wheel on the front to match the rear. They believe in adapting to real-world scenarios aside from just good numbers in the wind tunnel. Another feature of Giant’s new wheelset is the fact that they are tubeless-ready. Giant is making a big push in tubeless, which will be found on many of the models across the line. The wheels are ready to go out of the box, with only sealant needing to be added. A 25mm tire comes spec’d on the wheels with frame clearance to fit up to 28mm. We had two days of riding the new Propel while over in France for their launch. The first day we took to the track of Circuit de Nevers Magny-Cours, while the second day we did 80 kilometers through the rolling French countryside. While riding the track, the stiffness from the frame was noticeable, especially when accelerating through the corners. There was no flex coming from the bottom bracket, with the bike tracking straight with no hesitation. 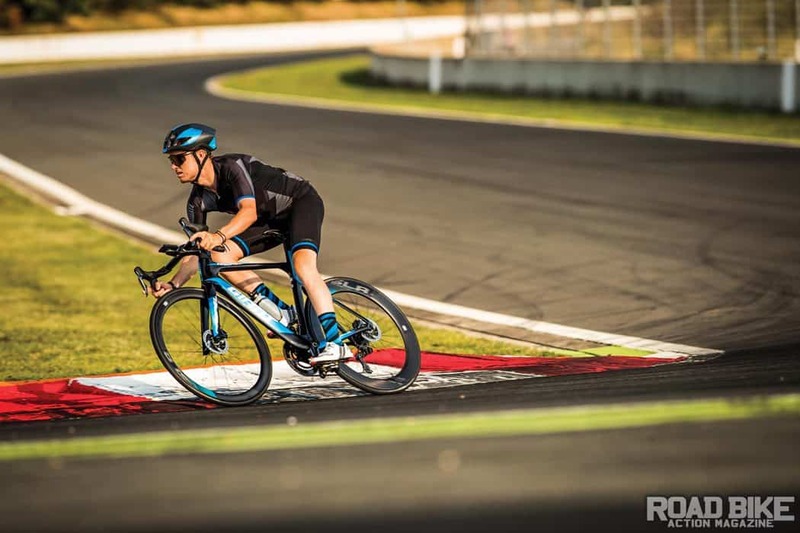 For a straightforward aero bike, the new Propel offers a very smooth ride, which is likely due to the combination of the new geometry with the tubeless wheels. We ran 85 psi in the wheels, which really allowed us to lean the bike over with confidence in corners. Racing into tight turns was a breeze thanks to the addition of the disc brakes, which far out-braked the side-pull brake that preceded them. On the morning of the second day, the ride started with rain and wet roads, which gave the disc brakes a chance to shine over the performance of standard rim brakes. In short, the difference was night and day! Aero bikes typically don’t respond well over punchy up-and-down terrain, but with the new smaller-depth front wheel, the Propel climbed fairly well. Deeper front wheels often hamper how quickly the bike can accelerate up a climb, and with this new wheelset, that issue didn’t seem to be the case. The new bar/stem system is a nice addition to allow for more size combinations and easy setup. The flat top of the bars is a bit large, especially if you have smaller hands. Shimano Dura-Ace Di2 always works great, and the added sprinter shifters were a nice touch while being in the drops. The new bar and stem system is a great addition, but consumers may still run into personal issues with adjustability. The two-piece design doesn’t offer any rotational adjustability, meaning you’re stuck with the factory-set position. Even though you can remove and swap out the handlebar for other widths, they only have the one compact bend available that works. Of course, you can put a new bar and stem system on the Propel, but at that point, you basically lose all aero advantages of the new system and you will now have exposed cables, which will cause added drag. To drop your stack, you will have to cut the fork and make sure you can still use the cap to hide the cable, because there is no room for spacers on top of the stem. All in all, we came away quite pleased with the introduction of the new Giant Propel. The aero category can be a tough market, as it’s a very specific rider who is attracted to such a bike. The disc brakes are a very nice addition, but will surely rub some people the wrong way with the fact that there is no rim brake option. We like that you can adjust the bar/stem combo to your size now, but you are still confined to their bar and stem. The fact that you can’t put a different bar bend on or adjust the rotation of the bar may hinder some consumers too. Additionally, we liked that the wheels are tubeless-ready. Aero bikes can be on the stiff side, so with the addition of tubeless, it seems to smooth out the ride. At $11,300, the 0 model does have an extremely high price tag on it which seems downright silly. Luckily there are three less expensive models to choose from starting at $3700.